Finally my laundry room functions! Don’t get me wrong there is still little things, such as getting that board off the wall under the cabinets! However I am functioning now! I bought that cabinets and the black granite countertop off of Craigslist almost 2 years ago. Some people were leaving their home and wanted to sell them and I wanted to buy them! I thought that it would help for storage and make a great table over my washer and dryer! Yes, I know the granite is not over top of my washer and dryer. When I bought the new set last year, I was also given a really good deal on the drawers under them, so…. I bought them too! I love the drawers. Since we have a small bathroom right next to the laundry room I keep the extra hand drying towels in one of the drawers! I also keep the hangers under the washer, because we hang dry a LOT of clothes, it doesn’t take long since it is so dry here in Vegas! There is a separator in the drawers which is perfect for separating the adult and kids hangers! So honestly this made the washer and dryer WAY to tall to put a table over them! I walked the guys outside, when they were leaving. When I came back in, Sean had already had the laundry out of the dryer and on the table! Hey, he was folding it, what was I going to complain about? He was smiling from ear to ear! Now, to tell you the truth, the table is a bit high for the normal persons liking. I am only 5’2 and my husband is 6’3 so he has a tendency to make things a bit taller so that he does not have to lean down, but I also wanted it tall enough to put that little dresser under it. I like to keep summer gear for the little ones pool, in there. No sense in taking all that upstairs! I love my functioning laundry room! Maybe this summer if I decide to go back to Ohio, we can work on my sisters! She has a really big laundry room, and she really wants to work on getting hers done too! Or maybe that is just me wishful thinking!!!! You ready Andrea??? As we are sitting at dinner, Shyla says “Mom, look! 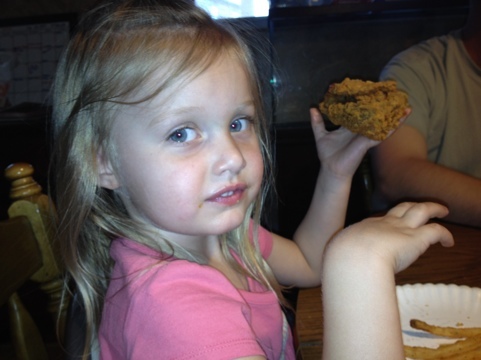 I have chicken fingers!” I thought it was so funny! I grabbed my phone from behind me and took the picture. 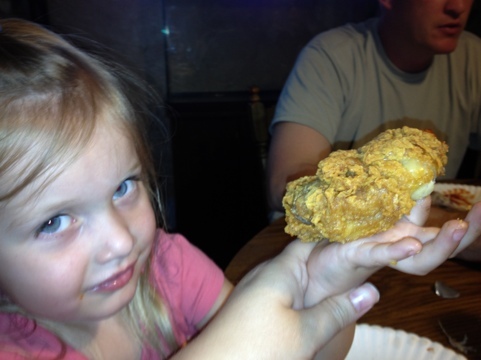 I got such a laugh, that a 3 year old would think of sticking her finger through her chicken, and calling it Chicken Fingers!! This was probably the best Mother’s Day I have had. Not that any of my others were not special, it just things were done a bit differently this year! Things that I will never forget. Our day started by us all getting up and ready for church. When we were heading home Sean asked for the umpteenth time what I wanted for Mother’s Day. The only thing that I had come up with till this point was a Filet for dinner (which he had gone to the store the night before to buy, and was going to fix it for dinner!) I told Sean that there were many different things he could get for me, but that I didn’t have any NEEDS, I only had a few different wants, but that they were not really WANTS, that I felt I really had to have right now (that is why they are WANTS, not NEEDS!). He said that he really wanted to get me something other than cards and flowers which he had already had for me. I told Sean that he could either take the kids to the Pandora store (my mom had purchased me a bracelet for my birthday last year) and let them pick out beads. Or since my mom just bought me a few wks ago, the charm bracelet from Tiffany & Co., they could go there and pick out a charm. So, he decided we needed to go look. We went to the Pandora store in Caesars on the Las Vegas Strip. It’s a very nice store, small but nice. We were greeted as soon as we walked in. Put a mental picture here….. VERY SMALL store, several customers. Sean, Jaden and I walking in, with a double stroller (front to back). I took a peek online before I went but nothing was really grabbing me, I have to see things in person, the internet is hard for me to imagine in my hand! So we start looking and the lady pulls out 2 trays. Jaden immediately points out the glass bead with green lady bug, I said “Jaden that is really green! Do you like anything else? Is there anything else that you think that we should look at?” He says “No mom, I think this looks beautiful for you.” When I was a kid, I loved green, I still like green, just not jewelry! The lady pulls out another 2 cases for the kids to look at, and then we go back to the first 2 cases. I was really hoping that Jaden would change his mind at this time. So I had picked out 2 beads ( both metal, one with Moon stone for June *Shyla* and the other with Citrine *Jaden and Schyler*) I thought that he could pick out 1 bead and that would give me the 3 beads total, one from each child! Sean lifted up Shyla “Shyla, what one would you like to get Mommy?” So she points to the glassbead with Red and Pink ! He tells the lady we will take that. He then picks up Schyler “Schyler, which one do you like for mommy?” She points to a purple ladybug glass bead. “Is that the one you want?” She said yes! Then Jaden again… Mommy, I really like the green one for you, can I get the green one for you? As you can see I have all 5 beads! And the green one is right there. I couldn’t tell him, NO. He picked it out, he really thought that I would like it, and you know what!!! I do, I love it, I love that he picked it out all by himself. This is the first Mother’s day, that Sean has not gone to the store by himself and picked something out for me, from all of them. He actually let each of them pick out their own individual gift to me. Yes, it was kind of my idea to get a bead… A bead. But I really like that I now have something special on my wrist from each of them. We went to Tiffany & Co. just to take a peak. When my mom took me, there was this ring for this year only, that I really liked and I wanted to show it to Sean. You know… so maybe he will remember later in the year for say… anniversary, birthday, Christmas something. He always says I never have any ideas for him, so this was my idea! We went in and I showed it to him, and he suggested we just take a peak at charms for later on too! So, we went to the back of the store, and began looking. He found this beautiful little clock charm (fully functioning!) and a Mom charm, and a heart-shaped “I Love YOU“. He purchased the “I Love You” charm for me, for Mother’s Day. I was so shocked. I now have a special memory from each of them for this Mother’s Day, my husband included! I really am not a materialistic person, that I have to be showered with gifts. I don’t want it to seem like that. This is just the first time, I have something from my kids that I will literally be able to hold onto till the day I die. The papers they bring home, you kind of stash away, and bring out occasionally, the same thing with cards. They buy you little trinkets that either disappear or you outgrow along the way. This is something that I can have right in front of me, now matter how old they are! I also was able to have a date with Jaden, we went to the movies to see Avengers. It was a really good movie, and I think seeing his face light up when I asked him to go somewhere special just the two of us. Made my day just a bit better than it already was! Sean had planned on making dinner for me that night, but because of Jaden and I go to the movies it did not work out! So, Monday night he made us ALL dinner. 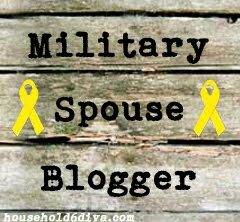 He made bacon wrapped Filet Mignon, baked potato with a yummy salad. Oh, what a very nice dinner it was! I am so thankful and blessed to have been given this family that I have! I hope that you had a very memorable Mother’s Day as well! On Tuesday, Jaden came home from school, in hand was a wrapped gift. A girl named Kate, gave him this gift. Sean had picked him up from school, and already been given the scoop. Sean just smiles! When I asked Jaden why he was given this gift, he simply smiled and said “because Kate is my friend and she likes me” REALLY? I have no idea what to do. Seriously? When I was a kid, no one ever sent me a JUST BECAUSE gift. She is not even in his class, he says they play at recess time together. Don’t get me wrong, this is not a complaining post. I’m really just curious at what age, do kids now days… just get and give “just because” gifts? It was so sweet… I said “Jaden did she give anyone else a gift?” he said “no, just me”, I said “is it her birthday, or something special?” Nope she just likes me, and is my friend. I love that Jaden has a new little friend, that likes him enough to think of him, but if this is just the 1st grade…. what is to come?? So, this morning to add to our daily grind, I got out a Thank You card. I asked him what he wanted to say. Thank you for the snakes that light up. They are fun to play with. this was his simple little note, and he drew her a picture on the top half of the card. Jaden and Kate playing outside together in grass with a blue sky, sun and clouds, with the little glow snakes! I think he smiled as much making the card as he did when he opened her package, with the ribbon! Anyways I just wanted to send this out, cause I got such a smile, in knowing his friend really made him happy! Thanks Kate, whomever you may be! Since Jaden turned 7 he has really started to enjoy all of the things that Lego has to offer! I think if I would let him he would sit everyday all day, putting every Lego together! So, we try to bundle up and buy them when they are on sale! So I have several extra boxes hidden for fun! Now, don’t get me wrong, I love that he enjoys sitting there doing that, but I also like for him to go outdoor and run around! However, he has been so good and focused, that we thought that it was time that he could sit and put together this bigger set. This is the biggest set that he has completed so far, at 783 pieces! It said that it was from ages 6-12, I think they are usually pretty accurate on the ages! It took him most of the day. And thankfully we were able to keep the girls distracted from getting in his way. They usually have a tendency to grab little pieces and run away. Then we are missing parts that he needs. For the most part he completed the entire project by himself, he did of course want his dad to come help out here and there! I think it’s just more of wanting his dad to be close, you know…. daddy time! My husband gave Jaden all of his old Lego’s from when he was a kid! So Saturday was his Lego day, what was yours? Thank you Lego for giving my son great memories with his daddy, and also helping him with focusing and being calm and collected! I am so thankful to have a great company like Lego around to keep my critters busy! What do your little ones like that keep them busy and not bored? There was a day the other wk. Just one day that we had no visitors. My mom left on Tuesday night, then our day off, and on Thursday my dad came to town. Anyways, that Wednesday afternoon, I was sitting here, and I was so tired, yet still trying to be productive, so I took a time out. When I looked over to the hallway, this was my view! Jaden is in TaeKwonDo, and the girls went and got into his sparring gear. He was in school, so I guess they thought that he would not care, and they could get some extra practice???!! I just laughed, I thought that it was so cute! 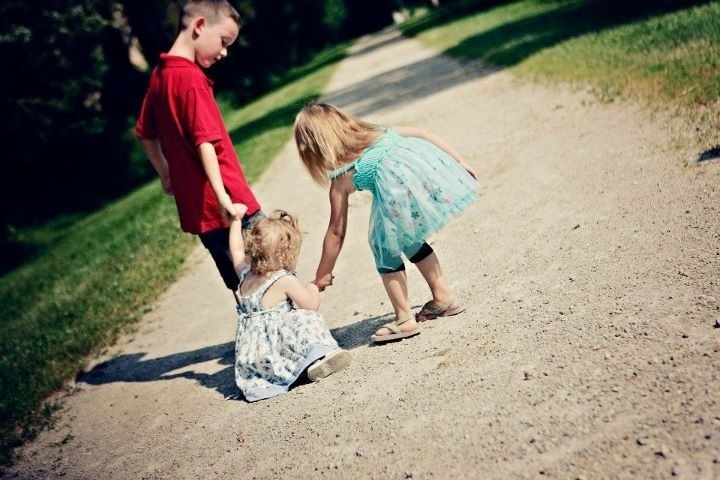 To tell the truth, the first one that was all dressed up, was Schyler and then they began helping each other out! Nothing like a little girl wearing a princess dress and sparring gear! Maybe they just wanted to be like their big brother? What kind of coupon carrier do you have? Well, I finally obtained a more efficient way of doing things when it comes to my COUPON TIME! My old coupon binder, was just a 1 1/2 inch binder, I used the same inserts, but I was limited on space, and it really was just not working for me. Staying organized is hard to do, especially with going shopping with 2 or 3 young kids at a time. So, if I was going to keep using coupons I really needed a better method of doing things. 1. We purchased a larger binder 4 inch! This one was just plain, so we were able to make a slip cover for it, and adjust it as follows! 2. Slots to keep pens and scissors. 3. I have a couple of pouches that have zippers and are NOT attached. However my mom put buttons on them, as you see in the picture so that they will connect! I have a little pouch to give to the girls as I am shopping, they carry it and when I pull out a coupon that I need at checkout, I hand it to the girls and they slip it in the pouch! Perfectly ready to give to the cashier! And then the pouch attached to the back of the coupon book for safe keeping! 4. because it is a slip cover, there is enough room to store the coupon book from the current wk, till I have time to cut and organize! 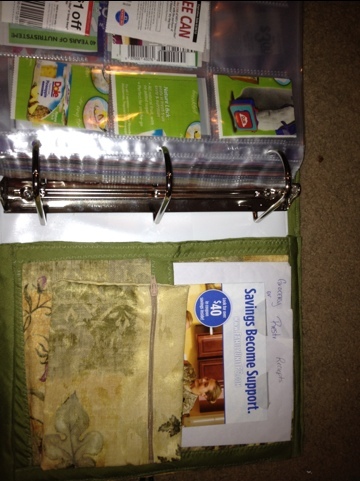 I slip the coupon book right between the slip cover and binder! Safe keeping!! I think that is about all we did other than make it to the store to pick out the fabric. I know it may be a dull pattern to some, but for me it is a lot! I’m pretty plain and like things to be simple. All in all, I love my new coupon book, and think that my coupon time can be a lot more efficient now! I have to give my mom credit again, for doing this for me! Shhhh.. she even shortened the curtains in my bathroom, they were dragging the bottom of the tub, so I was making the girls always take showers, they are excited they can start taking baths now!!! Hey, I bathed them, good thing they like showers!